A two-storey wildlife observatory is nearing completion at the home of one of only two known pairs of breeding ospreys in Wales. The 360 degree wooden structure is being built at the Cors Dyfi nature reserve near Machynlleth, Powys, with help of nearly £1.4m worth of grants. The site will open all-year round when work on the observatory finishes instead of its current five months. 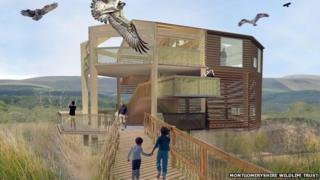 Its Dyfi Osprey Project attracted 31,000 visitors this year. The first osprey chick in the Dyfi valley for 400 years hatched in 2011 and this year two chicks hatched. Emyr Evans of Montgomeryshire Wildlife Trust, which run the reserve, said idea for the observatory came about three years ago. "We applied for funding from the Heritage Lottery Fund and the European Regional Development Fund's communities and nature programme and we received nearly £1.4m. Some of the money has been spent on boardwalks too," Mr Evans said. "The observatory will be 10m (more than 30ft) high and won't just be for osprey and bird watching, it will be for all sorts of wildlife and plants. "Other wildlife observatories have been converted from existing buildings, such as Bardsey Island lighthouse, but this is purpose-built and is probably the only one of its kind in Wales and the UK." Mr Evans said as well as birds, visitors will be able to see otters, dormice, some of the reserve's near 500 different species of moths and 96 plant species. "People will not only use the observatory to learn about wildlife, they'll also find out about the area's social history, its culture, the Welsh language and we're planning to use it for astronomy and chamber music events," he added. "It will be a great place for children to visit and in a safe environment see and learn about the wildlife, such as the ospreys." The observatory will open to the public next year.